Rob Barsby, chairman of Portknockie's flood action group. Campaigners in Moray pressing for a popular cycle path to be fully repaired have been given fresh hope their dreams will be realised. Surveys and investigations being carried out by charity Sustrans are due to be completed next week on the former railway line between Portknockie and Cullen. Next week marks one year since the route was hit with landslips following a deluge that hit the coastal communities. Now it has been revealed that a report to outline repairs to be done is expected to be prepared before the end of October. A finance package has already been approved by Moray Council to restore the slopes above Portknockie. Yesterday Rob Barsby, chairman of the village’s flood action group, stressed a similar “sustainable solution” was essential for the cycle path. 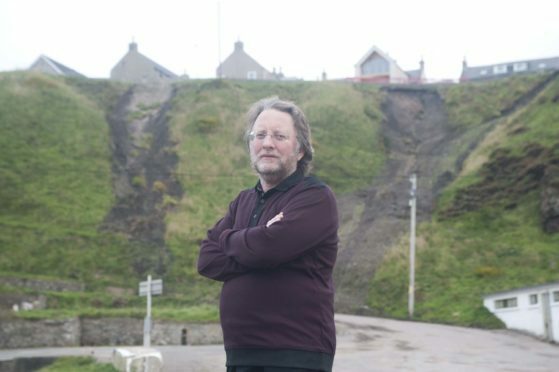 He said: “There’s nothing either side of the path where the landslips were which I presume is making things harder – you can’t cut into a bank because there’s just big drops there. “At least something is happening now with it because for a long time there wasn’t. Water accumulated on one side of the path near Cullen Golf Club during the downpour in September last year – forcing out soil underneath the route causing it to be undermined. Barriers were initially put up to prevent walkers and cyclists from accessing the route but they were repeatedly pushed aside. A temporary repair has already been made to the route to allow it to be reopened again last month in order for people to enjoy some of the most spectacular views of the Bow Fiddle Rock once again.